When Dr. John M. (Jack) Nihill, our director, joined Dental Health of Wheaton in 1981, he did so on the premise that each patient deserves the same level of care that he would give his wife and children. That each patient would be treated like family. Dr. Nihill, his associate, Dr. Gregory McBeth, and their caring professional staff comprise Dental Health of Wheaton’s dental family. Drs. 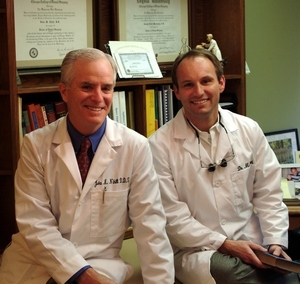 Nihill and McBeth are well-respected in the local dental community and have both been presidents of the Wheaton Dental Society. Together, they’ve enhanced and safeguarded the smiles of thousands of Wheaton families over the years. They are committed to giving their patients optimum-quality dentistry in a congenial, safe, fun-loving environment. They like taking good care of people, and it shows on the smiling faces of their patients.